Produced & arranged by The Chevalier Brothers. Recorded 1985 at gigs in London – mostly at the Dublin Castle, Camden. Tracks 1 – 9 were originally released on the first album, ‘Live & Jumping’ in 1985. Track 10 was a single released in 1986. The other tracks were recorded at gigs around the same time & were previously unreleased before this CD. 12″ 3 track single recorded October 1983. Released on Waterfront Records WFST 005 (including “On The Tip Of My Tongue” written by Roger Beaujolais). 12″ 4 track single recorded 1984. Released on Mean Records 12MN105 (including “The Ice Cream Man” written by Roger Beaujolais). 7″ and 12″ single recorded early ’86. Released on Disques Cheval DCG01 (2 track 7″) , DCGT01 (3 track 12″). 7″ and 12″ single recorded 1987. Released on Magnet Records CHEV1 (2 track 7″) , CHEVT1 (3 track 12″) (including “Shuffling The Cards” written by Roger Beaujolais). Album recorded live March 1985. Released on Disques Cheval GG1 (LP). Also released on ‘Victor’ records (VIL-28021) in Japan, ‘Disky’ records (DLP 2003) in Holland and on ‘Genlyd’ records in Denmark. All LP only. Album recorded July ’86 (first recording after Maurice left). Released in the U.K. on Disques Cheval GG2 (LP). Released in Japan on ‘Victor’ records VDP-1143 (CD), and VIL-28057 (LP). 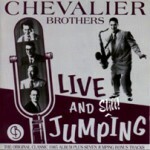 Released in Europe with different title : ‘Jump and Jive’ on WEA International 254 769-2 (CD), 254 769-1 (LP), and 254 769-4 (MC) (including “A Flash In The Pan” written by Roger Beaujolais). Album recorded March 1988, released on Disques Cheval GG3 (LP) (including several tunes written by Roger Beaujolais).